If you are considering a career in the dental profession, becoming a dental assistant is not only the first step towards advancement in the field, Dental assistants themselves have much to gain in the long term from acquiring accreditation as such. Across the US, dental assistants are in high demand. In the state of Tennessee, becoming a dental assistant is especially rewarding due to the speed and precision of Tennessee's career training programs. Dental assistants in Tennessee who obtain certification can also expect a higher entry-level salary of between $12-$14 per hour. 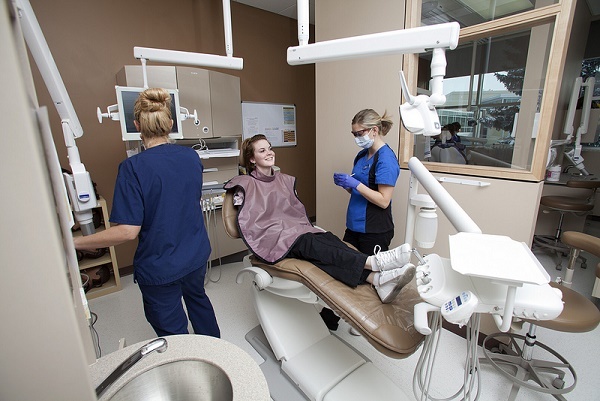 Tennessee offers a variety of highly accessible training programs, granting students first-hand training experience with dentists, dental assistants, hygienists, administrative assistance and more all within a fast-paced learning environment. As a whole career path, the US Bureau of Labor Statistics expects employment in the field of dentistry to grow “more rapidly than the average of all occupations through 2022” (BLS, 2015). Dental assistants can expect the gratification of helping others while earning a great salary and, if they wish, advancing to a higher-ranking career within the dental field themselves. Dental assistants may also work for nonprofits and social services, and with primary health care technicians. Reasons for becoming a dental assistant are vast. Dental assistants experience a high degree of patient variation, getting to know and assist people from different backgrounds. Dental assistants get to provide the middleman interface, which makes a dentist visit a more comfortable and friendly experience. Dental assistants develop interpersonal skills while constructing their own hands on medical experience, making for an extensive, all-encompassing medical training. Due to the great variety of work tasks a dental assistant will be required to carry out, no two days will be the same. Dental assistants are able to encounter a comparatively high amount of schedule flexibility depending on the dental practice they work for. Work is sometimes divided between more than one dental practice and can include part-time or full-time hours. More than one third of dental assistants work part-time, which makes for an active and involved workday with a higher income level, all while managing time effectively. Unlike most careers within the medical profession, dental assistants are not usually subjected to arduous hours or the need to be heavily relied upon for on-call/unplanned work. Dental assistants have more freedom to design a schedule that works for them. Networking with patients and medical providers is easier as a dental assistant as the job guarantees a high level of professional and personal interaction. With such connections come more routes to career advancements. After a few years of work as a dental assistant, one is entitled to undergo further training to become a hygienist, which can effectively double one's annual income. The working environment within dental practices is usually serene, organized and on chaotic, making it an enjoyable and relaxed place to work in comparison with doctors offices and emergency rooms. Coupled with a relaxed paced work environment are the sociable and reasonable business hours a dental assistant will work. Working hours that are most convenient for patients will also provide an ease of lifestyle for dental assistants themselves. The ease of accreditation for dental assistants is among the most convenient medical certifications possible. Although advanced degrees or training certification may serve prospective dental assistants well, the minimum necessary criteria is simply a high school diploma. Even additional vocational training isn't necessarily mandatory and doesn't extend much past 1 to 2 years of educational on-the-job training. There are many one year dental assistant career training programs after which one is qualified for entry-level work and pay in the field. There is never a dull moment as a dental assistant. This is due to the fact that working as a dental assistant in a dental office entails carrying out a variety of tasks all of which are diverse and all-encompassing. Dental assistants have a fast gateway to entering a professional and acutely organized environment. The atmosphere within dental practices is cleanly, calm and desirable. Becoming a dental assistant may also be an excellent career change for those already involved in the world of medicine or Health and Human Services. In terms of credentials, it is simpler to branch into while still thinking in terms of a career advancement beyond assistance positions. When weighing the pros and cons of a dental assistants working conditions, consider the high value of medical certification in a competitive job market. Tennessee's estate wages for dental assistants, while somewhat below those of more popular or populated states, nonetheless provide a greater opportunity for job openings, employment loyalty and appreciation for those who work in the field. Work as steady and despite any popular misconceptions or notions of dental assistants working a tedious or unsanitary job, dental assistants have very clean jobs, masks gloves, eyewear, special clothing and many more ways to protect themselves from infectious disease. The lifestyle opportunities granted to dental assistants make this career path especially unique as most jobs within the career field have the offer of part-time work (usually Monday through Friday and sometimes including Saturday). The ability to obtain good pay while maintaining leisure time is an increasingly rare find in today's job climate, especially when work includes standard hours and days as opposed to swing shift, graveyard shift, on-call, as needed or weekend and holiday jobs. Additionally, according to the American dental Association, a majority of all full-time dental assistants whose employment is provided by standard dental offices or private practices are granted paid leave and vacation time. This alone is a hard to find opportunity in today's job market. Because a great many dental assistants tend to the needs of young people, dental assistants are well situated in the baby boom years in terms of reliable pay and work. Dental assistants have access to special circumstances, which are projected to provide job stability, sustained good in, and many chances for career advancement. Dental assistants, statistically speaking, are projected to have some of the brightest futures of any career between 2010 and 2020. Not only are dental assistants providing a crucial supportive role to young people throughout pivotal stages of dental development, they also provide supportive and preventative dental care to the elderly. Dental assistants are well situated for building long-term relationships with patients just like a primary care family practice doctor has the ability to. This provides a uniquely rewarding opportunity for one's work to become one's passion is that the assistance see patients through many stages of life. Entry-level education for dental assistant is usually a post-secondary non-degree award. In the state of Tennessee, as with most US states, educational prerequisites for career as a dental assistant may include a high school diploma, associates or bachelors degree. On average, the only educational prerequisites for entering a dental training program are a high school diploma or GED. Dental training programs rely on specific requirements given by each community college, technical school or career college. Dental assistant training programs usually take one to two years to complete. The timeframe for certification depends on whether students are pursuing a certificate, associates degree, diploma or additional certification. Along with dental education courses, dental assistants will undergo great deal of in office practice and training, operating under the management of dentists, administrative staff and other instructors. •	State-level enrollment in a commission of dental accreditation (CODA) sponsored program and successful completion of it. To begin the official application process for dental assistant licensing in Tennessee, one must file to the State of Tennessee's Department of Health. Within the state Department of Health, applications go to Tennessee's Health Licensure and Regulation Department. Along with proof of the necessary certifications for dental assistant licensing, the application checklist includes letters of recommendation, proof of citizenship, proof of education and all other information necessary to run a full background check. Dental assistants are usually required to work 35+ hours a week for full-time work and, on average, 25 hours per week for part time. Within the median range of hours dental assistants are expected to work in the state of Tennessee, somewhere between 36 to 37 hours is the statewide norm. The median expected annual salary for entry level dental assistants in Tennessee is between $24,000 and $27,000. However, income can range higher, between $30,000- $4,00 a year or higher depending on the dental practice a number of hours worked. Popular cities to begin practice in Tennessee for desirable wages include Chattanooga, Clarksville, Franklin, Germantown, Hendersonville, Jackson, Johnson City, Kingsport, Knoxville, Memphis, Murfreesboro and Nashville. Dental assistants have a higher level of job security in the all too needed position within an all too needed field. Job growth in the field is expected to continue to escalate by over 30% through 2020.Tennessee is also falling in line with many state to state rises in terms of an increase in the number of new dental practices needing new staff. Benefits for dental assistants usually include paid vacations, medical insurance, sick leave, reimbursement for academic course fees, pension plans 401(k), bonus plans and other profit-sharing. Dental benefits are often included portions of employee coverage plans. Dental assistants are uniquely situated in a growing field with both a relaxed and fast-paced learning experience at their fingertips.